Following up on his The Wanderer project, one of InFiné's seedlings dives headfirst into bucolic abandon with a new EP under a new incarnation: Aārp. Along its five delicate, spiraling electronica piece, 'Novae Gemmae' (from Latin “new buds”) plays like a naive ode to the rebirth of flora. 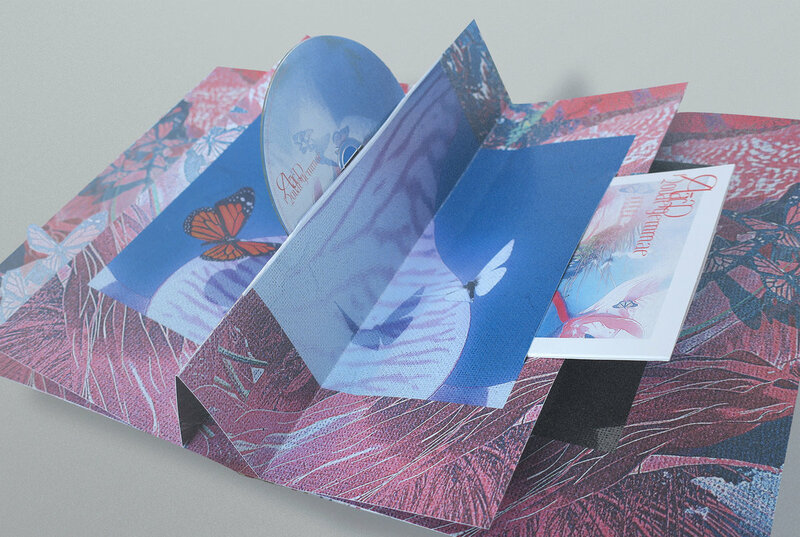 Visual artist Patrice Acardy from Lif3.app studio imagined an original 'pop up' CD pack to accompany this release “which follows each stage of flowering buds”. Interview available in French here. You have already worked together on the previous EPs of Aārp (under the name of The Wanderer) in which the visual dimension is almost inseparable from the music. How was your collaboration born? Aārp: The collaboration was first born and made possible thanks to the internet. One of my friends came across Patrice's work, and sent me a video that instantly appealed to me, so much so that I watched it on an endless loop. When it came time to find an illustration for ArchiTextures, I wanted to reachout to Patrice. At first, his illustration was in gray and then he found this beautiful blue that we ended up calling "Blue Architextures". Then, it became natural to work together on the rest of my releases. To put it simply, his illustrations add to my music as my music adds to his illustrations. It is a tireless exchange and co-construction. Patrice Acardy. : We are both hyperhumanists at heart: technology, mutual aid, sharing and optimism. What is your creative process, together, or on your own? Do you think you have developed a common language as you collaborate? With Patrice, it's the same thing except obviously that for a long time we had never seen each other because he lived on the Island Reunion and I in mainland France. So we each worked alone physically, but not in spirit thanks to constant exchanges via internet; despite the distance it was sometimes like we were working from the same workshop. P.A. : I work in an organic way, that is to say that one idea generates another one constantly, I try to simply push each idea towards its maximum possibilities. An idea can really start from nothing. My inspiration comes from my environment. I leave a lot of room for lucid dreams and intuition. I do not always realize, but I am an image control freak, as much as Emmanuel is a control freak over his music. I pay close attention to every pixel, every frame that I produce, it must be beautiful and precise in the background as in the main subject of the piece. A.: I never tell myself that I'm going to do an EP or an album when I start working. At best, I know they will one day construct a coherent project. Above all, I make music for my personal consumption but always in a controled way, as Patrice has just said with his work of the image. I really can not say how Novae Gemmae was born. Surely pieces that I composed a little in a hurry, which pleased Patrice to whom I asked to make illustrations, he proposed them to me, I liked them. It always comes a little like that! P.A: With Emmanuel we spend a lot of time writing. He writes his notes and I draw my sketches. We create and then put on paper our intentions. This is for us a way to take a step back on the works that we propose to each other. It is important for us to hear what the other person has to say about his or her work, so that the work has one voice. I do not really know if we wanted to develop a common language as such, but it is obvious that a certain mythology and a plastic-sounding vocabulary have built naturally as we collaborate. A.: As I said before, this music is a product of everyone around me, who allows me discover new things. To ask if I developed a common language with Patrice, I would say this is surely true. I think it's easier to judge that from the outside looking in. For me this is fluid exchange, but from the outside, maybe it is not. It depends on how the work/project is approached. Patrice has another perspective as he just said, I did not consider it like that. Both of you are passionate about music and classical painting, especially Flemish painting, which seems quite surprising when working with advanced 3D software. How do you integrate these inspirations in your work, as much on the music as on the visual part? A.: My education was first and foremost in classical music, which aided my discovery of other musical cultures late on. Despite the fact that my music is confined to electronics for the moment, I have always used a classical method of construction. In collective representations, classical music is seen as something very codified and rigid, but even in formal models, there are treasures of experimentation. This is precisely the case of the experiments of Gesualdo, one of my favorite Renaissance composers in the madrigal model. It is therefore perfectly normal, if one is looking for experimentation, to turn to the classical because it has too been experimental. P.A. : My work is an infinite field of experimentation and hybridization, for a better world, at least that is one of my intentions: I was born and I lived all my life in the Island Reunion ... Before doing 3D my medium of predilection, my first love affair with art was drawing (academic drawing of the Italian school), then a few years later, painting. It was during my studies at the School of Fine Art (Beaux Arts) that I really understood the importance of the philosophical, scientific, and human issues of these arts. Leonardo da Vinci bequeathed to us a legacy as bizarre as it is sensitive, for example. 3D art and "classic" arts are not incompatible. The idea of creating and proposing a contemporary vision of a Flemish still life naturally imposed itself on me. For Novae Gemmae, I wanted to work a sky, clouds, an orchid, bark, and Monarch butterflies. In the entirety of my artistic work these are recurring items, we could associate a symbolism to each of them but the viewer is free to make their own interpretations. To use 3D allows the generation of very smooth images from the start. Due to this quality, I felt the first artworks that I sent for Aarp lacked something, the addition of the texture of the canvas, cracks and peeling paint, finally allowed the work to blossom. Aārp, is there a connection between your university geopolitical research and your musical composition work? A.: At university, I learned a lot of information but also a learning method. Learning this method was not easy, and sometimes painful. It was extremely hard to to stick to. During my final year, I tackled many subjects rigorously - I rewrote essays until they were understandable (sometimes up to 15 times!). But learning via a method is life-saving because things are clearer to me. Now I can better organize my ideas and it allows me to hear the changes between ArchiTextures, ArchiTextures_Rmxd, and Novae Gemmae. ArchiTextures demonstrated a still, somewhat messy spirit; and Novae Gemmae is a clearer EP. Maybe the evolution has evolved with maturity. So yes, university learning methods have influenced my work because I learned to think more concisely, while at the same time learning a lot of knowledge. It was there that I met my best friends, as well as gaining an appreciation for many things, including botany. So really, it was a very important time for me. The Novae Gemmae EP is an ode to nature, from its name ("new buds" in Latin) to its semi-artisanal packaging (for a limited edition of physical copies). As artists, do you think you have a role to play in relation to current environmental issues? A.: As an artist - not really; but as an individual in the community - yes. If I had to hold a public political speech, it would be in my own name and not as an Aarp. As an individual, with publications closer to my academic work, and it's methods - not so related to music. Music, in that it is non-figurative, is a more difficult medium to translate as being engaged or not in a subject. As an artist, I'm just trying to make music and that's a statement already. As music is part of it’s own market, I tend to see political speeches being mobilized by artists, as a way to create a selling point for their music. I prefer to stay away. The defense of the environment is one of the most important struggles of our century and it has become sadly commonplace to say so. It is a social, political and economic fight all at the same time. To preserve, protect or conserve nature is not to exclude humankind but to integrate them out of all productionist systems and logics. The competition to increase wealth and privatization, at all levels, even to the detriment of solidarity, is today the first of the evils that nature suffers from by locked in this way of thinking. What I wanted to show with Novae Gemmae is that nature is ransacked but still, it reappears beautiful again every spring. One must of course be aware of environmental issues and be concerned with sustainability issues, but, in addition to rethinking the productionist models, I think that we must review the place of humans in nature and redevelop a contemplative perspective. It is this position that I try to work towards myself, and maybe it has been reflected in my music. P.A. : Yes, Novae Gemmae is a semi-artisanal object. 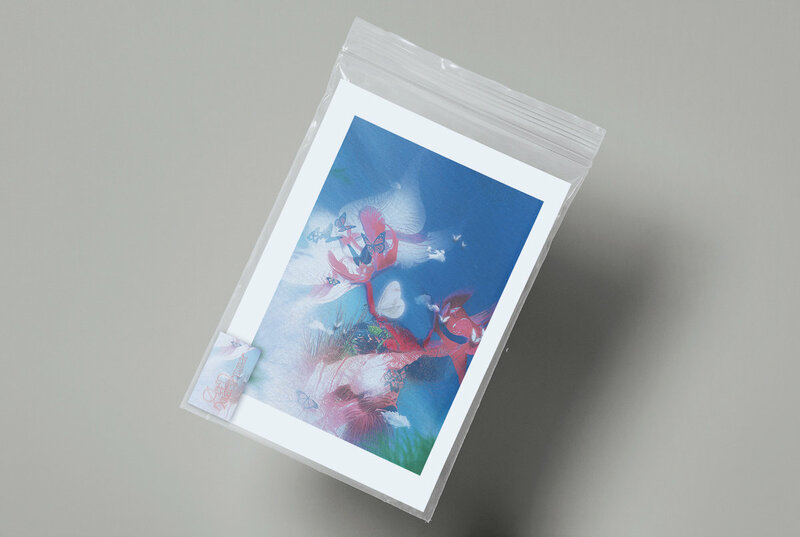 I thought the packaging of the CD as buds that are in constant process of blooming. I think that the project must be embodied from its content to its container. Aspiring to align with Aarp's intentions in Novae Gemmae, but still have an ecological conscience. To be honest, I admit that it was very complicated to apply this idea. This experience has proved to me that what is essential is to find a balance between the beneficent and the harmful because perfection does not lie in the end of things. Having an ecological conscience is not like saying "I am an ecologist!" I think we have to be humble and wise in talking about environmental issues as not to constantly contradict ourselves. I use machines, I consume energy, undoubtedly excessively and unnecessarily… To create images is the only thing I can do correctly, in any case. I wanted to include recycled and recyclable paper. I believe that it is the sum of these little wishes, of high hopes and their acceptance which are the strength of our intention. This project aimes only towards the renewal of things, human and nature in particular.